Looking inside the box, I saw comics that were born during the Silver Era of Comics. Archie and Batman were quite common but most important were his Amazing Spiderman comics. He bought the very first ten issues and more of Marvel’s famous superhero. They were all in relatively good condition with the Spiderman comics now in a protective covering that prevented wear and tear on the decades old paper. Not only did I saw them but I read them as well. He allowed me to read his precious collection which he had kept for all these decades; it speaks volumes to know how much trust he had in me. And after reading them, I have to say, they’re pretty good! Stan Lee and Steve Ditko did a great job in the writing and characters of the story. I also learned for the first time of Doctor Octopus’ origins. Surprisingly, it wasn’t shallow. He wasn’t naturally evil; in fact, he was just a nuclear scientist who used his arms to help him in his experiments. An explosion at his lab however twisted him into becoming dark and that’s what led him to being Spiderman’s foe. The Sandman issues were pretty good as well as they definitely highlight Peter Parker’s cleverness and ingenuity. I would say that my father’s love for comics is similar to my love for video games, a fad that was quite popular for the time despite being frowned upon by some adults. In a way, the video game cartridges I have, though still cheap, will probably one day be as expensive as my Dad’s current comic collection. Even now, games like my Earthbound game have already doubled in price in just several years. In the future, my other video games will probably follow suit. My Dad’s love for nerdiness does not end there though, he also likes Star Trek and he remembers watching that show a lot when he was in college. He’s also a fan of Star Trek: The Next Generation. I like watching that show with him as it’s pretty relaxing and enjoyable. It was especially a treat when we saw the Star Trek movies as they were great and he got to enjoy them on a nostalgia level. 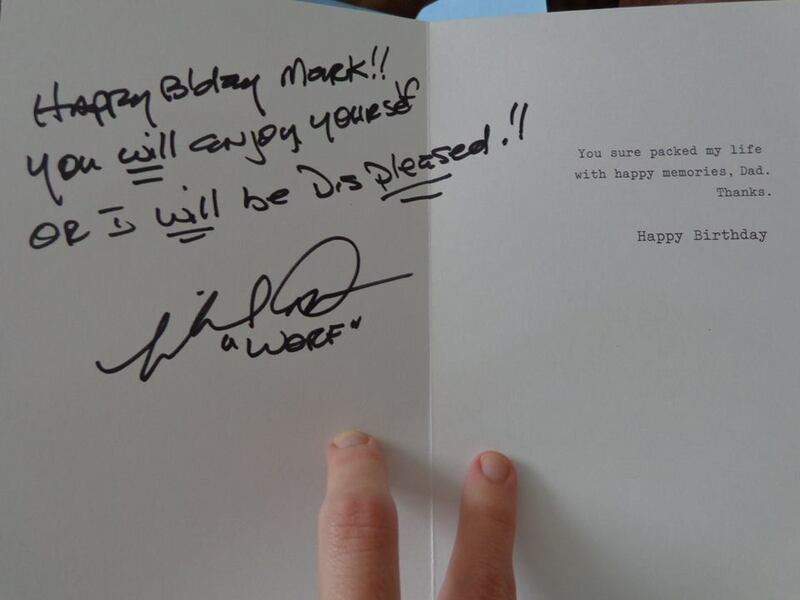 As such, I was lucky enough to have Michael Dorn, the actor who plays Worf in Star Trek: TNG, sign a birthday card for him. He was at a nearby comic convention this year and I bought tickets for it so I could meet him personally. Worf and Data were my Dad’s two favorite characters so I knew this was my best chance to give my Dad something special. Once he signed it, which was amazing, I carefully sealed up the envelope and gave it to my Dad several weeks later. That was my only present to him that year. And when he read the funny card and opened it up to see that Michael Dorn had wish him a happy birthday he reacted with shock and delight. I could see tears welling up as he realized what I had done for him. Right there and then, I knew I had given him the best birthday present ever. Actually, this was not the first time I attempted to have a celebrity sign something for my Dad. I tried to get Stan Lee to sign my Dad’s first issue of Spiderman several years ago when I was at Comic Con. Alas, Stan charged 100 dollars per signing and I didn’t have that kind of money. I’m super bummed that I didn’t do it though. When I told my Dad why it didn’t happen he became convince that we should do it and that he would chip in the money for the autograph. We’re now hoping for Stan to show up in a nearby convention so we could have the man himself sign the very thing he’s famous for. I think that would be one of the most wonderful things ever and I hope that we can achieve it; an autograph from a legend to two nerds and a special comic. This entry was posted in Uncategorized and tagged Comic Books, Dad, Father's Day, Spiderman, Stan Lee, Star Trek on June 16, 2014 by Andy.